HONOLULU — Due to the assistance of the Consulate General of Japan in Honolulu and the Japanese government, a large blue plastic storage bin found floating in the ocean off Waimanalo, Oahu, on Sept. 18 has been confirmed as belonging to Y.K. Suisan, Co. Ltd., whose offices in Miyagi Prefecture were affected by the March 2011 tsunami. 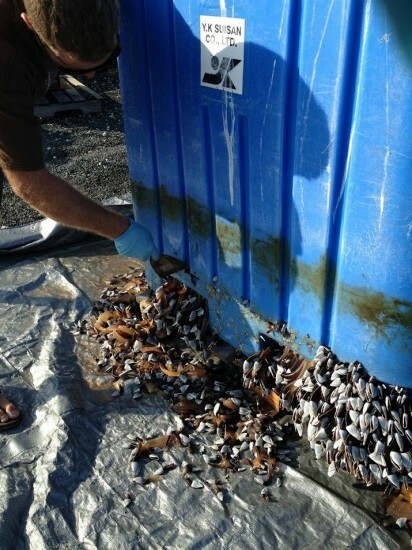 It is the first confirmed piece of Japan tsunami marine debris to arrive in Hawaii. 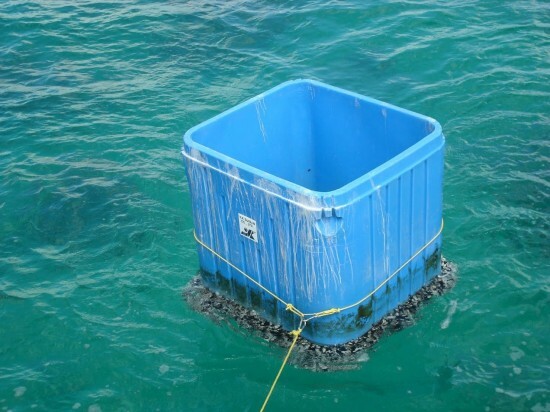 The 4-foot cube bin, which is used for transport of live and frozen seafood, was spotted mid-way between Manana Island and the nearby pier by Makai Ocean Engineering staff and retrieved by the Hawaii Undersea Research Laboratory. 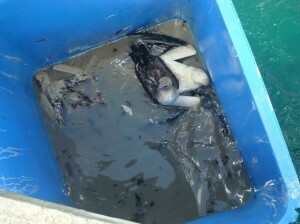 The bin was taken by DLNR aquatic resources personnel to its research facility on Sand Island, where samples of marine organisms were identified as common pelagic species of gooseneck barnacle and crabs that live on floating debris in open ocean areas. They were identified as not invasive to Hawaii. The bin was cleaned, and a scan of the bin by state Department of Health technicians showed radiation readings were within normal background levels. In a related development, a large concrete dock, similar to one that washed ashore in Oregon last June, is reportedly floating near the main Hawaiian Islands. The dock was first reported to a local media station by fishermen, but there have been no additional sightings since last week. DLNR said that it “is working with its federal partners to locate and track the floating dock last reported north of Molokai. The department is considering all of our options for handling of the dock and working on contingency plans in coordination with other agencies, to protect marine resources and prevent its arrival in near-shore areas. “We invite fishers and boaters or pilots to contact DLNR main administrative numbers at (808) 587-0400 to report timely sightings and locations. If it is after hours they should leave a detailed message of the location, GPS if available, description of debris, and their contact information (optional) so staff can follow up with further questions if needed. For more information on NOAA’s response to tsunami debris, click here.